The Bulletin de la Société Française de Luth has referred to Florida International University Professor of Musicology David Dolata as a “gentleman de la Renaissance” for his activities as a performer and scholar. A native of Buffalo, New York, Dr. Dolata graduated from Case Western Reserve University (PhD), the University of Cincinnati’s College-Conservatory of Music (BM & MM), and Niagara University (BA). At FIU, Dr. Dolata coordinates the Music History area, directs the Collegium Musicum, and is former Director of the School of Music. As a lutenist, he has appeared at such venues as the Glimmerglass Opera, the Florida Grand Opera, the Northwest Bach Festival, the Miami Bach Society, and on broadcasts and recordings for NPR, CBS, and BBC. With Il Furioso, which he co-directs with Victor Coelho, he has recorded Kapsberger’s 1623 Book of Arias and Battaglia d’amore: the Music of Bellerofonte Castaldi on the English label Toccata Classics. He appears on several other American and European recordings as well. 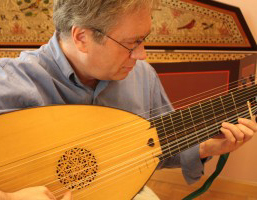 His research on early 17th-century Italian lute music has been published in Recent Researches in the Music of the Baroque Era, Early Music, Acta Musicologica, and Grove Music Online. He has been visiting research professor at the Centre d’Etudes Supérieures de la Renaissance (CESR) at the Université François-Rabelais de Tours – CNRS where he is co-editor of the CESR Encyclopedia of Tablature with John Griffiths and Philippe Vendrix. David Dolata also maintains a long-standing affiliation with Boston University’s Center for Early Music Studies. His book, Meantone Temperaments on Lutes and Viols, has just been released by Indiana University Press.